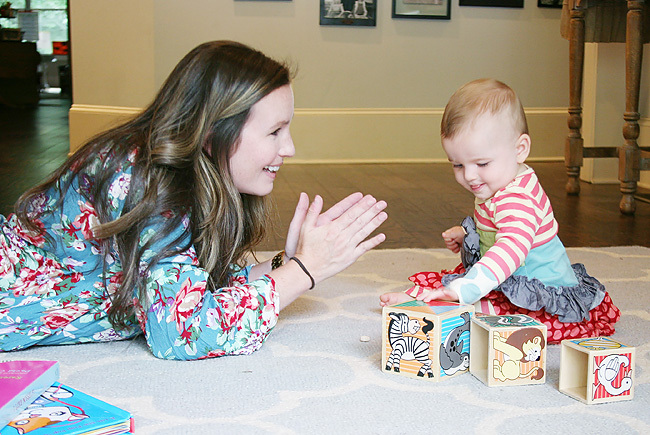 One of the hardest things after you become a mom is feeling confident. Confident in the choices you are making as a new mom. Confident in your new body and the changes its gone through. Confident in feeling trendy and put together when you are presenting yourself to your peers - even if you do have the occasional spit up or mystery handprint on your sleeve. As moms, there is nothing we want more than knowing we are able to wake up each day feeling comfortable in our own skin. We like our fashion to reflect that. From the moment our eyes open to the moment we kiss those sweet babies goodnight each day, we are on the go. Sure, we can roll out bed, grab our favorite pair of yoga pants and start our day - Who doesn't love to rock the yoga pants each day (and you know we can)? - but 9 times out of 10 we feel way more confident when we actually get dressed in a real outfit everyday. Fall marks a new season and a new reason to give our selves a little confidence boost with new style. Last year, we shared our love for PinkBlush. 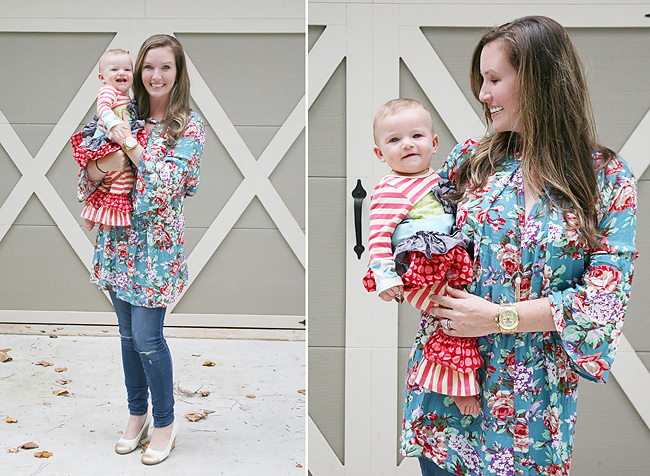 We absolutely loved both the PinkBlush maternity and women's line of clothing. Not only does PinkBlush offer trendy and affordable fashion for women of every size, but their pieces make the transition from one phase to the next effortlessly. 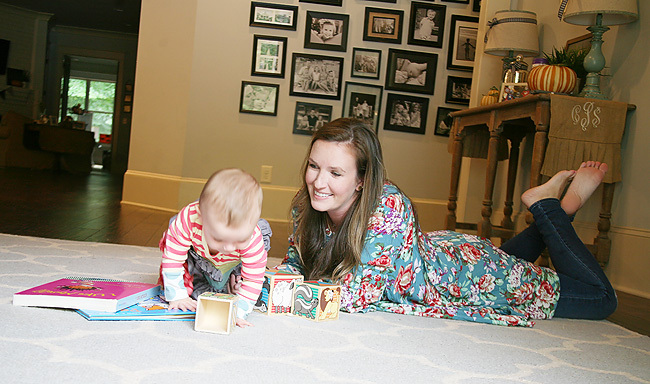 One of our favorite things about PinkBlush's maternity line is that they offered pieces that were current trends that mirrored pieces that were being offered in the non-maternity section - just with a little wiggle room for that growing bump. I've learned one thing with PinkBlush's pieces over the last year, and it is that they make the most transitional items to wear. With each of my three little ones I was never blessed with a body that looked super model ready with in hours. And that's okay! But I still wanted to feel comfortable and stylish while I was in that transitioning phase to my "new body". 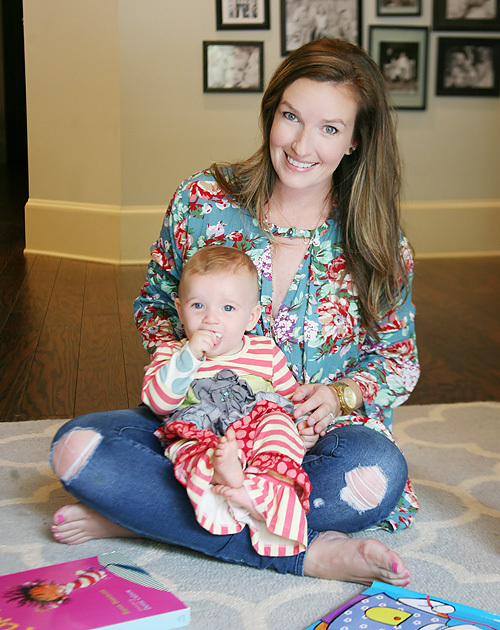 Even on those toughest postpartum days you want to feel confident and stylish, and I found myself reaching for my PinkBlush tops without a hesitation. Even today, at eight months postpartum, it is my go-to place for fun stylish attire. I know with just a few clicks though the trendy online boutique, I am able to find anything I might need. Whether that is something to wear that is fun for everyday style or for a quick date-night ready look. 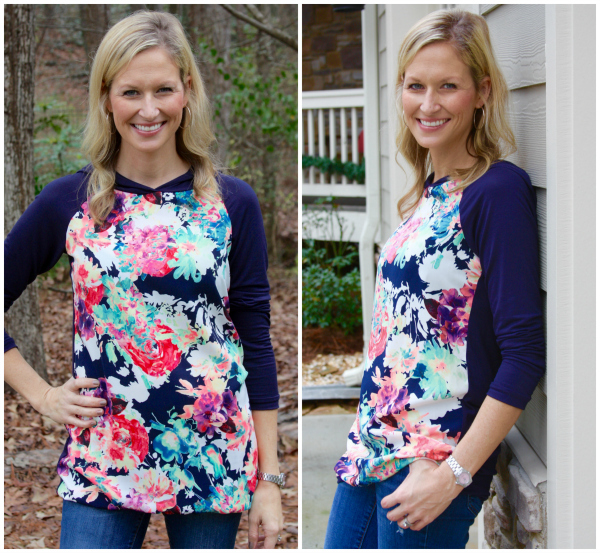 This floral tunic has been one of my favorites for fall lately. I like to wear florals all year long, and this bright floral pattern in fall jades and reds just makes me happy. It's loose and flowy, which is perfect for both nursing and for being comfortable for whatever the day's play might bring. Yet, I still feel as though if I had to run into a quick meeting or go out to dinner with the girls I am ready. Even if you aren't toting a new little baby on your hip, you still want to feel confident, comfortable, and stylish throughout your day. Whether volunteering at the school, cheering on your little from the sidelines of the soccer fields, or headed out for that much needed date night, we want to feel as though we are rocking that mom wardrobe in the best way possible! Most of our days are spent running from one activity to the next, with very little down time. I want to make sure I am comfortable in all situations and have learned that the tunic tops and tees from PinkBlush are some of my closet staples. They are so comfortable and soft, yet stylish enough to get me through any situation I might encounter throughout my day. I love the little details that PinkBlush sneaks into each one. 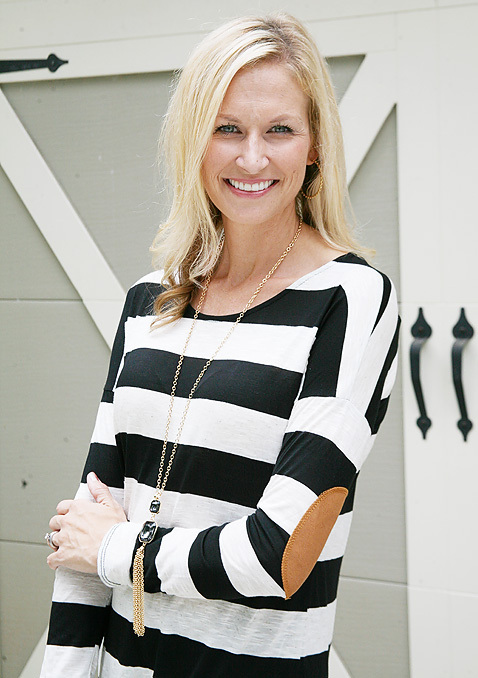 This striped top has fun suede patches on the elbows to give it a little something extra. It's those little extras that I feel finish off the look and give me that trendy feel I am looking for as a mom. We just love that we can shop at PinkBlush this fall and know that we are able to get trendy style for all our needs in just a few clicks. Whether you are a mom-to-be or a mom with little ones spending this fall frolicking at college, we wanted to share our PinkBlush love with you. 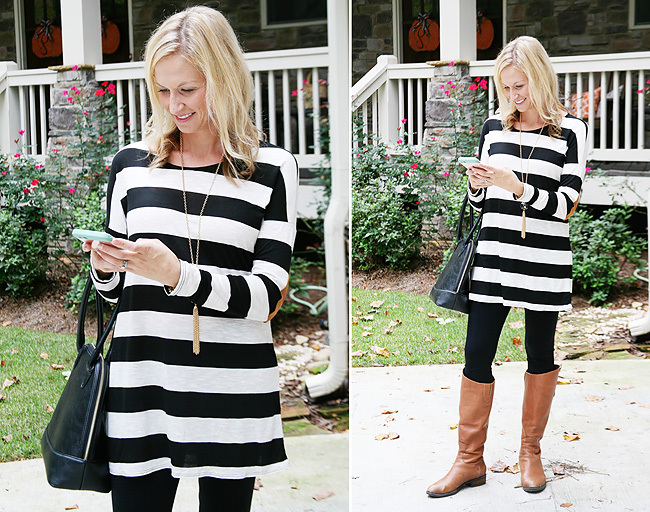 We are teaming up with PinkBlush to giveaway to one lucky reader a $50 gift card! To enter comment leave us a comment below with what your favorite fall style from PinkBlush is. Check on Instagram for additional ways to win. Love the plaid accent tops! Great for fall. Thanks for introducing me to PinkBlush. LOVE these! I have 5 top in my cart, uh-oh! I see lots of shopping happening here for me! Oh the tops are just adorable. I soooo want that floral one! I like the floral tops. I like th Black Crochet Sleeve Plus Size Maxi Dress. I like the maxi wrap dresses. Very cute! My favorite fall style has got to be the hats! I love how they make an outfit look!